a. 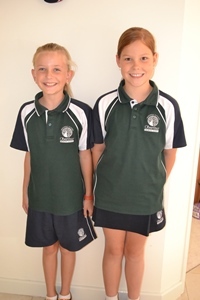 School uniforms are to be worn on all school excursions. b. Thongs, singlets, tank tops, bicycle pants, ‘muscle’ shirts, board shorts, are inappropriate school wear. c. It is most important that footwear is of a closed-in type eg. sneakers, runners, shoes, closed-in sandals. Safety is an important issue when choosing footwear. The uniform shop is located in the Middle block. Opening times are advertised in the newsleter. The store provides school uniform needs including school carry bags. Prices are competitive and orders can be taken. Please contact the Uniform Co-ordinator through the school office, for further assistance.